Sea Life Surveys have been studying marine life on the west coast of Mull for 30 years. Our experienced guides are here to educate you on the oceans’ cetacean life, bird life, and local history, so any questions please ask. The craft is licensed to carry up to 50 persons and has ample indoor and outdoor deck space including the top deck which gives a better vantage spot for viewing wildlife. Our craft has toilets, a tuck shop serving tea, coffee which will be available throughout the trip. Our guides are fully trained in all aspects of onboard safety. Aimed at everyone from toddlers to grannies, this 1.5 hour trip leaves Tobermory Bay heading Northwest past one of the family Stevenson’s lighthouses, you will then cruise alongside a fish farm learning about salmon farming as well as getting the history of Bloody Bay where the farm is located, learn the secrets of the famous Spanish Galleon that sank in Tobermory bay. You have the chance to see Sea Eagles, Golden Eagles and of course many seabirds. Harbour Porpoise are also often seen. Visit a seal colony on calve island before learning the history of the waterfall in Tobermory bay prior to your return to dry land. 1.5 Hours. Why not come and join us on our 4 hour voyages fun for all the family looking for some of the oceans greatest cetaceans? Primarily we see Minke Whales, Basking Sharks, and Harbour Porpoise on a regular basis. Not so common but occasionally spotted are Dolphins, Orca, and Sunfish which we mostly see between the Isle of Coll, Isle of Muck and the entrance to the Sound of Mull. All the sightings you see with us are logged and recorded for research purposes helping us to understand the behaviour and movements by cetaceans in the scottish waters of the Atlantic ocean. there is also much bird life to be seen – Puffins, Gannets, Razorbills, and many more sea birds. There are also White-tailed and Golden Eagles to be seen around Mulls shores. 6 hr Whalewatch explorer with island landing. 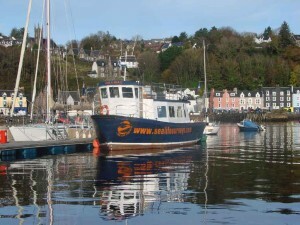 This 6 hour trip gives you the opportunity to dip your toes into the more open water past Ardnamurchan Point with the chance to encounter the larger marine wildlife found around the West coast of Scotland during this trip the most commonly seen of the larger wildlife are the majestic Minke Whale or the 2nd largest fish in the World: the Basking Shark. You will also stop en route looking for White Tailed Sea Eagles, Harbour Porpoise and the range of Seabirds that spend time feeding in our waters. whilst out viewing the islands that surround Mull weather permitting you will be able to land on one of three islands depending on wind Direction Muck, Coll to view the tranquil splendor of these islands or the isle of lunga to see the puffins. During your journey there will be knowledgeable guides on board to assist you so that you have a thoroughly enjoyable and educational experience. Adult £80 Child £40 Family (2 adults & 2 children) £195.